This gluten-free recipe from About Life in Sydney can be made a day ahead. Rinse quinoa under cold water and drain. Bring water to the boil in a saucepan and add quinoa. Cook for about 15 minutes, until water is absorbed and grains are fluffy. Cool, add coconut milk and refrigerate overnight. When ready to eat, reheat quinoa and coconut milk in a saucepan, stirring occasionally. Add chopped banana and half the walnuts. Add agave nectar or honey and stir. When hot, pour into a serving bowl. 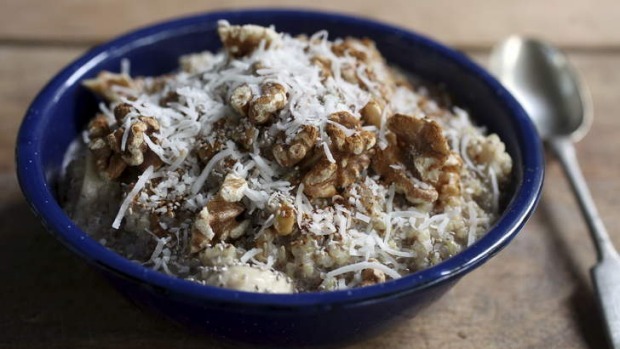 Top with remaining walnuts, grated coconut and chia seeds, and sprinkle with cinnamon.